By Rebecca Nickols on October 20, 2010 Visit Rebecca's Website. Since I’m 10 weeks into my chicken experience at the start of my blog, I’m going to begin my chicken story by explaining how this all started… We lived in the city for 12 years in an old house with a small yard. I think I had something planted in every inch of our plot. When we moved to our current property on 7 acres, I’ve been in heaven with the endless possibilities for gardens and such! It’s been fun to add a new bed each year or try growing something unusual. All gardeners know that part of the fun is planning for the perfect garden next year, and that next year will be the best yet! When we were first married 25 years ago, my husband had very little skills in carpentry. Every repair he did seemed to take forever and cost twice as much as it should. After the job was complete, he would say–I now have more tools and I’ve learned something new. When he started the coop, he didn’t have any plans or blueprints. He looked at photos of coops online and made the plan up as he was building. I remember when he was well into the coop reading about a roosting bar. I told him that maybe he should add one–ha! We really were learning as we went along! Siding, windows, shutters, doors and a tunnel from the coop to the run followed…. Next, Jeff decided to add a living roof to the coop. 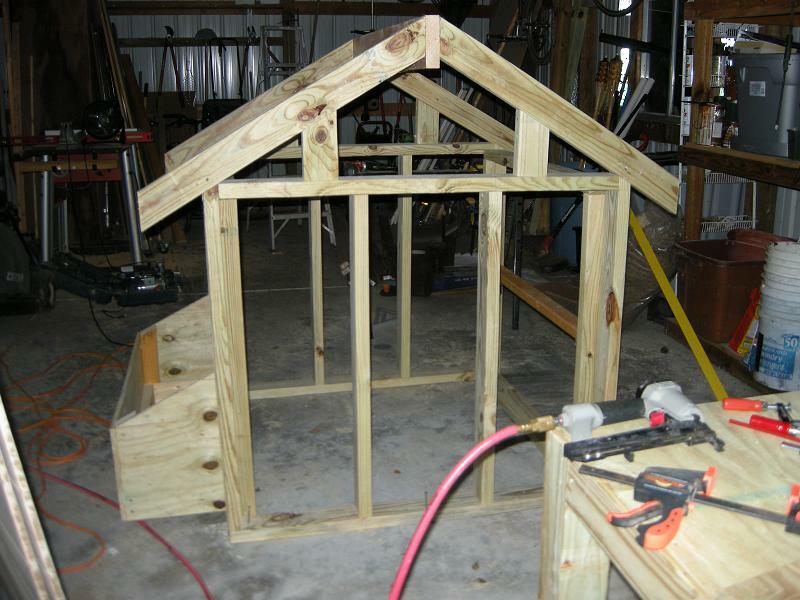 He makes bird houses and feeders with living roofs and he said that a chicken coop is really just a large bird house!… The frame of the roof was covered in a water proofing cloth and made to allow for about 4 inches in depth for the planting materials. He put horizontal slats in the frame so that the slope didn’t cause all of the soil/moss to move down the pitch of the roof. I put a soil/compost mixture in first then added a lot (3 bales) of sphagnum moss and secured it with chicken wire. The roof is planted with winter hardy–drought tolerate sedums and succulents. It requires no watering other than the rain.–It should look great next spring! Finally we predator proofed the run by attaching 1/2 inch mesh hardware cloth–3 foot high around the perimeter and over the top. A 2 foot wide skirt of chicken wire went around, and attached, to the bottom/outside of the pen. I pity the animal who tries to go under, over or through this run! Now to get the chicks!…..
Gotz can be talked to from the tenpheole in your home. Just go to your home and call him. His hours are 11 am to 4 pm every day except for Saturday and holidays.Been around chickens all my life and Mum has bred them for over 30 years. Rebecca, I am a single mom with a 37 year old special needs daughter, with a mind of a 2 or 3 year old. I just bought a house on 2 aches of land 1 1/2 years ago so I could move my special needs daughter in with me. She has been living in a state school since she was 11 years old. I want to build a chicken coop and pen because I love the chickens and I think it would be good for my daughter. I do not have much money so I have very little to work with. I had a nice man I met in a feed store who gave me a little bit of chicken wire. 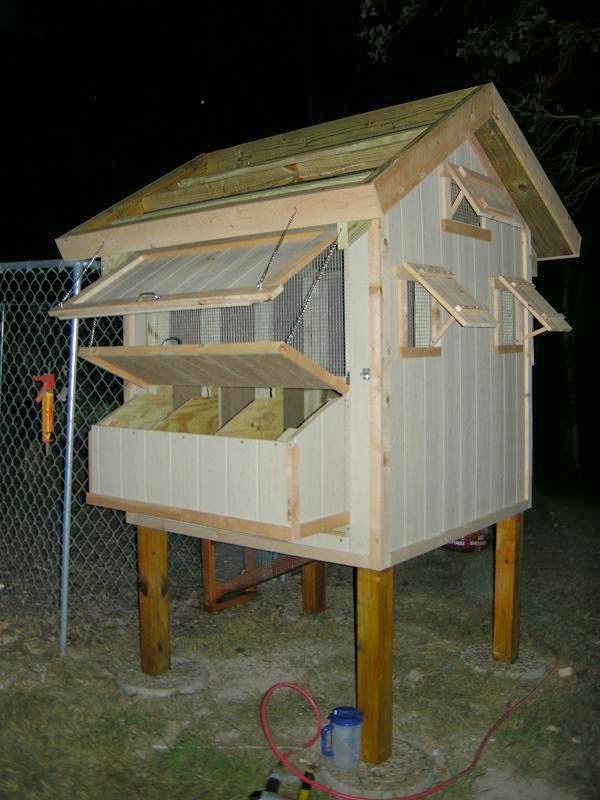 I love the design of the chicken coop and pen you and your husband made and I was hoping that you wouldn’t mind sending me some kind of instruction so I can attempt to build it myself. I can not afford to hire anyone to do it for me and beside I think I would love to try it myself and maybe be able to get my daughter involved in building it. Would you or your husband mind sending me some instructions to build the living rood chicken pen and coop? Thanks so much. Great coop! I plan on getting a couple/three chickens after I move (hoping it happens soon). The living roof is a super idea. I would plant it with something that the chickens would like – great addition to their diet. For those with larger flocks, there was a plan on Mother Earth News (I hope I’m correct) that had a garden with a “chicken moat” built around it. Lots of room for the chickens to roam and they’re totally safe – so is the garden. I think I have a copy of the plan/drawing if anyone wants it and can’t locate it. Fredalyn–Unfortunately eggs do freeze… I try to gather eggs more frequently during the day when the temperature is below freezing. I live in Upstate NY where the winters can get real cold. I was wondering if you have ever had a problem with your eggs freezing. I have noticed a lot of chicken coops designs have the nesting boxes where you can get to the eggs from the outside. Think we’ll settle on a design similar to this, and a beginner carpenter, too. Am a novice, so can you show more “inside” pictures of the roosting areas and the door for the chickens to get to the fenced area? Can that door be secured as well, for cold weather and additional predator protection? Thanks! this is great! I love the fact you lined it to prevent roof rot in the future. Like you I lived in the ‘City’ on a postage size lot for 10 yrs & went batty, we only have 1/3 acre now but its heavon for this ole lady. I have problems with fishercat (mink family) up here in Massachusetts so I had to build a coop in my large shop to protect the ‘girls’ but gave them small doors to an outside heavily fenced, chicken wired run. I love the living roof idea because you could also plant herbs & lettuces for the chickens if you wanted to in the warmer months. My neighbors would kill me but I always thought doing a dandelion above ground box would be great because the chickens love the them & the plant is so healthy for them to eat on. I hope to hear more about your adventures. The tray is made out of scrap lumber, runs the length of the roosting bar and is about 2 inches deep.–Nothing fancy, but it’s a nice feature when it’s time to clean the coop! What material did your husband use for the removable tray and how deep is it? 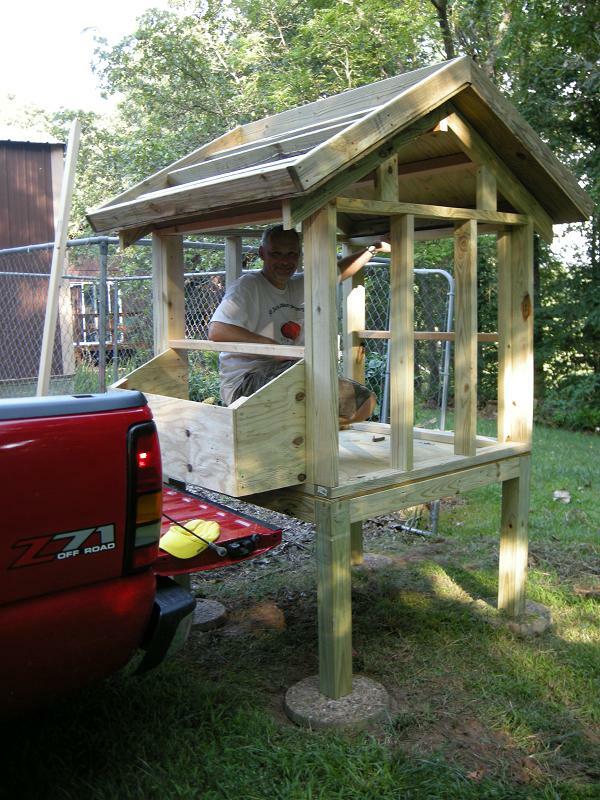 My coop is 4’x4′–so I could easily add to the flock which I probably will next summer. I understand your frustration, two of my girls are roosting on the edge of a nesting box also and it is VERY annoying. I’m not sure how to break that habit. Shredded paper for the bedding–what a great idea! From what I see in the pictures, your coop is slightly larger than mine. Yours looks square; whereas, mine is narrow–more of a rectangular shape. And I have two nest boxes on the outside. With three roosting bars, I’m able to have 6 chickens AND a rooster. And all of them roosted on two of the three bars throughout the winter. Unfortunately, the girls have developed a habit that is soooo getting to me. Two or three of them ALWAYS sleep in the nest boxes, which means they soil the bedding. Which means, soiled eggs. By the way, I use shredded paper for bedding and it’s great! Recycling AND the stuff is great for the compost–chicken poo + the paper strips help to keep the compost aerated. *The living roof is just for fun–it’s unique and an excuse for another garden! Actually, it’s a great natural insulation for the roof also. I’m not able to let my chicks free range, not only because of the wild predators, but the domestic ones as well–cats and dogs…I’ll let them out when I can watch them, and they are SO mad to go back in the run! How many chickens did it hold ? & Did the Raccoons Kill all your Chickens? I always Make sure i secure the girls @ night lock and bolt them in . We have a skunk in our yard somewhere & i have been told they kill chickens too. I am going on the 3rd year w/ my girls and so far they have been attacked by 3 different foxes and 3 different hawks, during the daylight hours!,They are free range so they wander all over i think it makes a happier chicken. But if i leave i lock them up in the pen and then let them out again when i return home.I am in Maine. Where abouts do you live?. 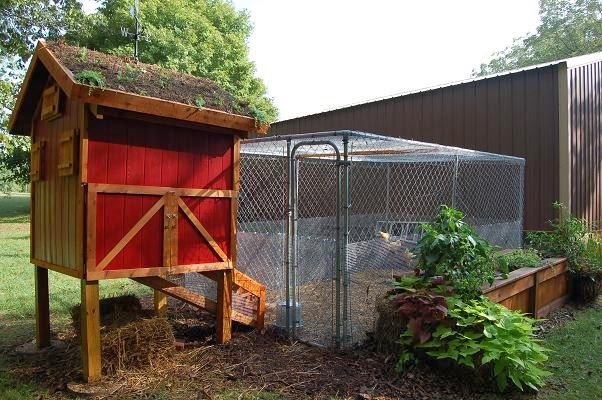 I like your house design — although I do not fully understand the “living roof” feature — but what will you do when the chickens have eaten all the grass in their dog kennel yard? Are you able to let them free range during the day? I’m not so sure I can allow mine free range on account of predators, so I have been looking into various portable set-ups. *My husband attached the coop’s tunnel to the pen with a staple air gun, he said it’s important to have the tunnel in placed and stapled to the chain link before cutting the wire. We then secured the hardware cloth to the pen with zip-ties–making sure there were no openings large enough for any type of predator. *To rain/weather proof the frame of the living roof–plastic sheeting or tar paper will work. Because the roof is pitched, leaking is not as much of a problem as a flat roof would be. Then a thicker material such as a pond liner would work better. Using sphagnum moss also helps because it absorbs and retains a large amount of water. *There is a window that lifts up above the nesting boxes.. I love the coop !!! I sure wonder what kind of chickens you’ll end up with … I LOVE my Golden Commets. Most of the eggs are so big that the lid of a jumbo carton hardly close. Love the coop! I notice that above the nest boxes, the side of the coop lifts up. Why is that? 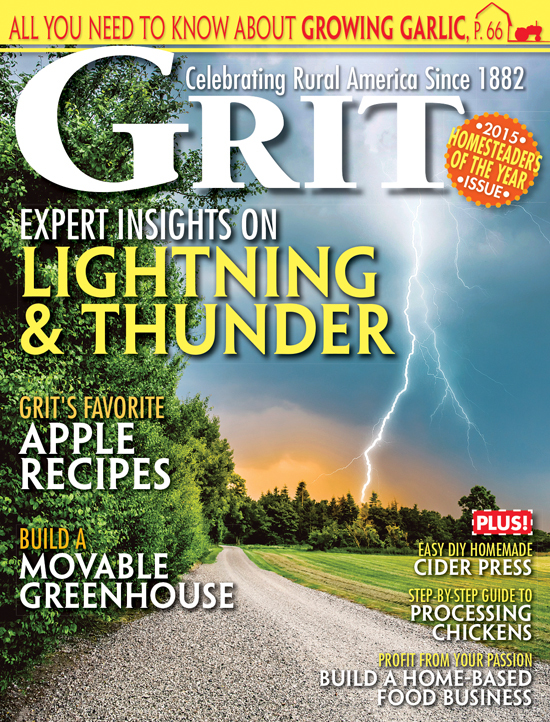 Did you use sphagnum moss, or peat moss for the roof? I so dig the living roof!!! Could you please tell me more about the weatherproof cloth you used and where you can find it? what a great coop! Could you post or send a picture how you attached the run with the chain link fence? We have predators, and a big dog that would love to play with our future chicks :)…so we are researching “proofing”. Getting to the nesting boxes without much effort is definitely an advantage of the coop being elevated, but the most important reason is that our Ozark raccoons are curious, intelligent and cunning…They would have no trouble figuring out how to unlock the door and visit the chicks! Wonderful job and you can’t tell with the plants around it’s a chicken domain. I am still in the process of deciding what mine will look like. I have about 70 hens and 14 roosters, so I need BIG. Too many roosters normally, but I butcher so some will be fryers soon. Whats next, maybe a turkey house? I’m guessing it’s off the ground to make cleaning the coop and retrieving eggs easier. Nice coop! Looks terrific, but I have one question. Why is it so high off the ground? Thanks! We had a lot of fun building the coop. I’m not sure if the chicks realize how good of a life they’re living! Wow – this is a really fantastic coop, Rebecca! I’m jealous!